With today’s introduction of the world’s first 3D Cinema LED screen at Arena Cinemas’ Sihlcity theater in Switzerland, Samsung Electronics continues its efforts to make traditional, projection-based cinema technology a thing of the past. Designed and installed with the help of Imaculix AG, the 3D-ready variation of Samsung’s Cinema LED screen maintains consistent brightness for immaculate delivery of subtitle text, images and minor visual details for viewers wearing 3D glasses. Unlike standard 3D cinemas, the Samsung Cinema LED screen provides consistent picture quality across an entire theater, ensuring a uniform, immersive viewing experience for viewers in every seat. 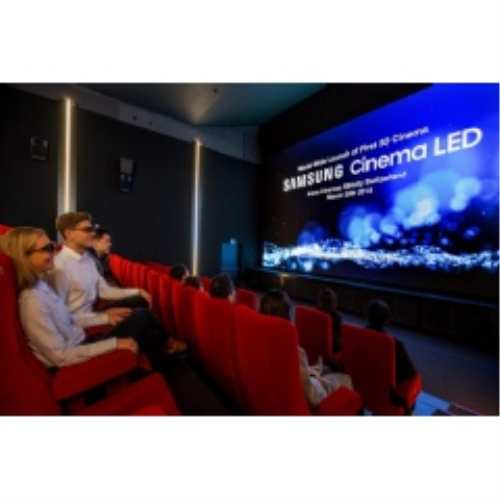 As the industry’s first Digital Cinema Initiatives (DCI)-certified High Dynamic Range theater display, the Samsung Cinema LED screen invites Swiss consumers into a next-generation viewing experience. Stretching nearly 10.3m (33.8ft) wide and 5.4m (17.7ft) in height, and featuring nearly 9 million pixels, Samsung’s Cinema LED screen delivers exceptional visual quality, technical performance and reliability. The Samsung Cinema LED display amplifies on-screen content through HDR picture quality. All visuals shine through ultra-sharp 4K resolution (4,096 x 2,160) and peak brightness levels nearly 10 times greater (146fL) than the common cinema standard (14fL). The resulting high contrast showcases bright colors, pristine whites and deep blacks, making it perfect for both 2D and 3D movies. Paired with state-of-the-art audio technologies from HARMAN International’s JBL Professional brand, it is a truly immersive experience. First introduced in July 2017, Samsung’s Cinema LED screen has been successfully installed in theaters in Seoul and Busan, Korea and Shanghai, China. The Arena Cinemas partnership marks the first implementation of Samsung’s Cinema LED display in Europe and is the world’s first 3D Cinema LED screen.